Prepare the prawns by cutting in half lengthways. Place the breadcrumbs mixed with the lemon zest in a separate bowl, the flour in another and the beaten egg in another, then firstly dip the prawns into the flour, then egg, then coat with lemon breadcrumbs. Deep fry the prawns for 3-4 minutes until the crust is golden, then remove from the pan and set aside. Meanwhile, heat the oil in a large wok or frying pan and stir-fry all the vegetables for 3–4 minutes until softened. Add a splash or two of water to the wok if necessary. Stir in the sweet and sour sauce and combine with the vegetables. Toss well over the heat for 2–3 minutes then add the prawns and lime juice and prepare to serve. 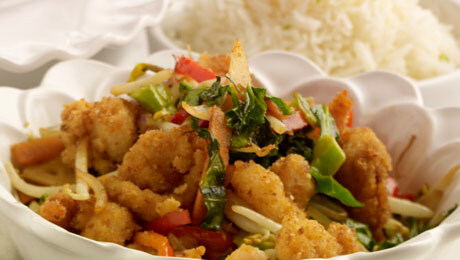 Serve the basmati rice in the centre of the plate and spoon over the prawns and vegetables. Sprinkle with some fresh lime zest if desired.